We are proud to announce that The OppO Group has teamed up with a number of Colleges and Universities across the UK to deliver FREE education programs for Ex-Military personnel. These free education programs are only available to those that have served within the British Military. In some cases those who would like are considering long term education programs within certain sectors The OppO Group maybe able to assist with funding. This would only apply to those courses that are significantly higher than the ELCAS grants available such as degrees etc. 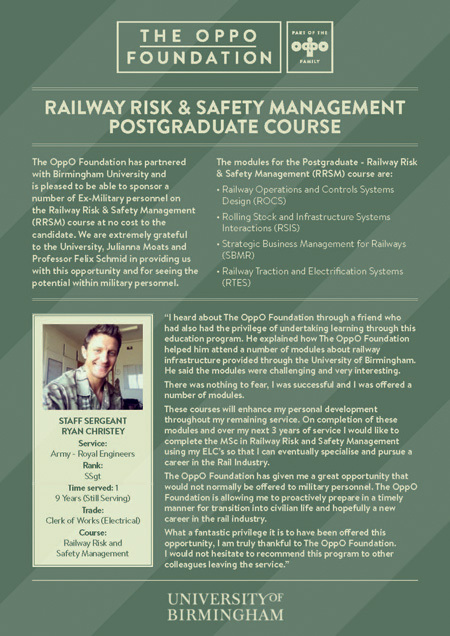 You would only be eligible for this if you are still serving in the British Military and have a desire to enter certain sectors such as the Rail industry.